Updated to 1.6.4! I really have no excuse for not releasing a 1.6.2 version, so I won't try to make one. Sorry I let you down, guys. It won't happen again. 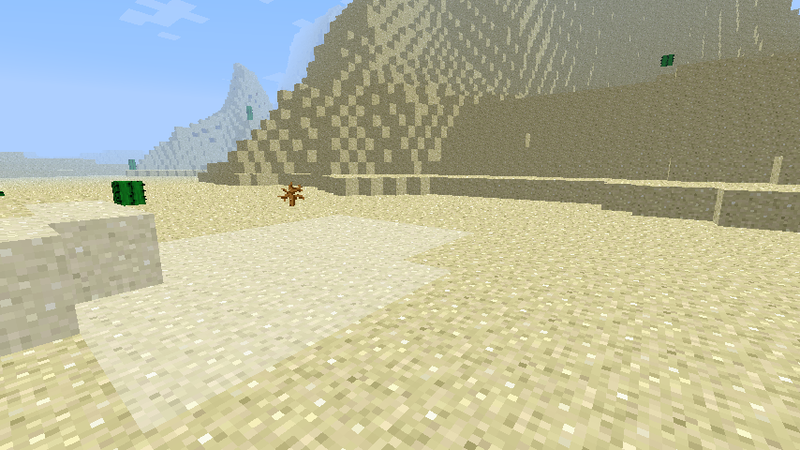 Ever thought Minecraft could use some quicksand? I think it would be a really neat addition to the game, but unless Mojang agrees, a mod is the next best thing! So here it is.Quicksand falls like sand or gravel when unsupported and any mob unfortunate enough to fall in is doomed unless they can dig themselves out fast enough. It is generated rarely in jungles, frequently in swamps and on beaches. It can also be crafted for a yield of 8. This can be used for traps of all sorts, defenses, mazes... whatever needs to be hazardous! 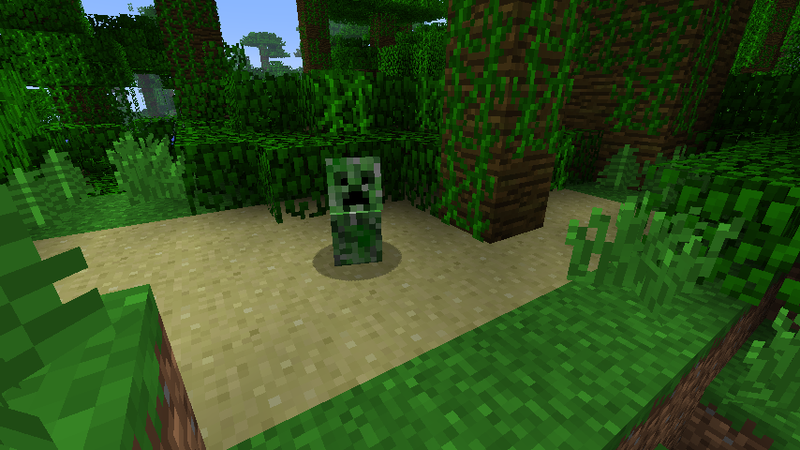 It only smothers tall mobs if it is at least 2 blocks deep. It also damps explosions like water.Dry quicksand is quicksand's desert counterpart. It only generates in deserts and is non-solid, meaning you just fall through it. It is easier to get out of, but also easier to stumble into. Since it looks like regular sand, it can be used for sneaky traps and secret entrances! It can also be crafted, yielding 8. The grappling hook can be used to pull yourself out of quicksand if you fall in, provided there is something within reach to latch onto. It can also be used to crawl around in caverns, but be careful as it can quickly drop you to your death if used improperly! Install: 1. Run Minecraft Forge installer. 2. Place zip in "mods" folder. (5/2/2012)-[1.2.5] V1.0~Released(5/3/2012)-[1.2.5] V2.0~Added natural generation(5/9/2012)-[1.2.5] V2.1~Re-textured to dark sand. No one liked my old texture~Fixed quicksand sounding like stone when hit.~Increased crafting yield to 2(Two blocks are used to craft it. Conservation of mass! )~Now generates in shallow water, like river beds and swamps, just like in real life!~Much more rare to occur naturally. (8/3/2012)-[1.3.1] V2.2~A quick port to 1.3.1. Nothing new because I'm just going to rewrite it at 1.4 anyway :/(11/3/2012)-[1.4.2] V2.1.1~Updated to 1.4.2~Added config file. (11/30/2012)-[1.4.5] V3.0.1~Updated to 1.4.5~Ported to Minecraft Forge~Improved world generation~Made crafting recipes more forgiving(can craft anywhere, not just in the middle)~Added dry quicksand~Added multiplayer support(1/4/2013)-[1.4.6] V3.0.2~Updated to 1.4.6(1/17/2013)-[1.4.7] V 3.0.3~??? (3/25/2013)-[1.5.1]V 3.3~Made quicksand slightly faster.~Balanced by being a little easier to break.~Made non-opaque so adjacent faces are still rendered. Doesn't change appearance, but keeps it from being abused to see underground tunnels before the "suffocation" effect kicks in. (10/2/2013)-[1.6.4] V3.1.0~Updated to 1.6.4 (about damn time, lazy wolf)~Changed crafting recipes. More expensive, but even greater yield. Quicksand was rather expensive before, for being sand, dirt, and water that is.~Added grappling hook. Why not make it randomly generate? Very cool mod! interesting one question is it able to go into the mods folder? This would be better if it generated naturaly.....In REALLY deep pits so there's no survival! great idea for a mod! i could see this being in a collection of trap mods, another addition that i can see is leaf blocks that would make you fall though that could spawn in the jungle. also, it would be cool if this generated naturally. This would be amazing if it was generated naturally. I made a mod review for it! The video is not as good as I hoped it would be because I've been having some microphone troubles lately and It's 3 in the morning haha. Hey! I made a mod showcase for your mod with a 3D thumbnail and everything! Quick video i made to show the mod. WOW! Thanks so much guys! It's greatly appreciated! It's found deep underground currently. I'm trying to make digging deep more hazardous, but this may change, as it isn't very realistic. I'll be sure to make a video of this later. Though, I am a kid, so the voice will be kinda childish. Hey could you please add a way to change the quicksands block id from a config file? You see, it appears that quicksand and Risguamis shelf from his shelf mod both use ID 132. When I tried changing the shelve's ID, it came up as an error with Redpower. Redpower was saying that the shelf mods shelf was still at ID 132 even though I changed it. I had to disable the shelf mod to get minecraft to work. So things would be much easier if I could just change quicksands ID. So please add that. Texture looks like vomit, huh? You're not the first to say that haha! I'll make a better one for the next update. Thanks for the review!